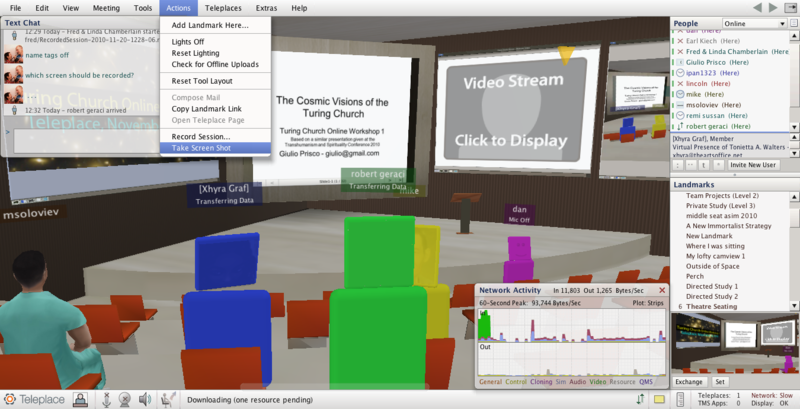 Attended the Turing Church Workshop and will write a post on that tomorrow but for now… I have to say that I’m pretty impressed with Teleplace. It’s an intuitively easy to use* interface that allowed for a great meeting/workshop. I don’t even think it’s because I’m used to Second Life. Basically if you’re used to menus [like Windows… or those other people, lol] you can use the interface without much trouble. The reception area also has a great hands on tutorial.